Rich Yessian’s contemporary condo sits atop the antebellum building at 301 King that houses an Apple Store on the first floor. 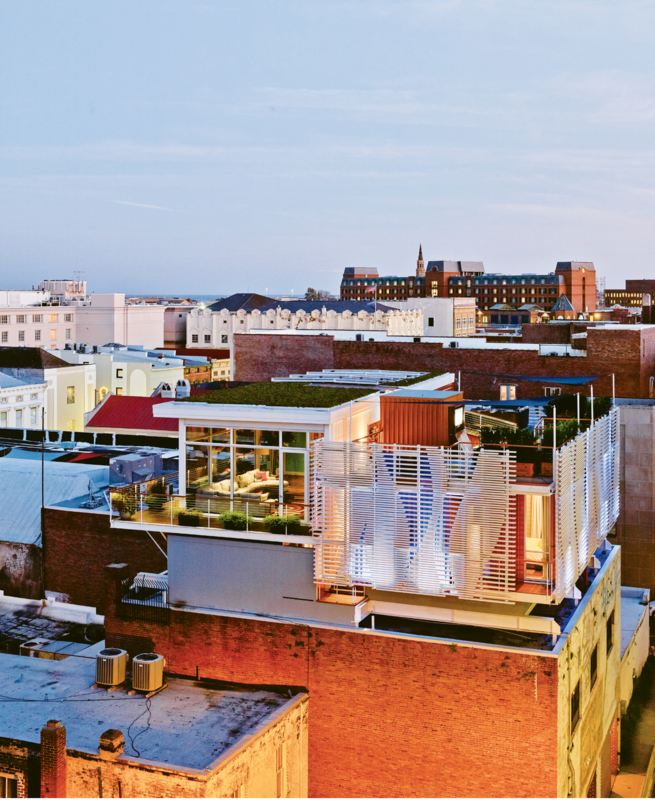 The addition—which boasts a green roof, outdoor living room, and fiberglass louvers that act as a bold design element and a privacy screen—is barely visible from King Street, leaving one of downtown’s most picturesque historic landscapes intact. The residence can be seen best from Liberty Street, where this photo was taken. From this vantage point, its striking angular lines add a rare modern layer to the city’s architecture. Colorful pots of hardy cast-iron plant (Aspidistra elatior) line the steps to the rooftop living area. Inside, a royal palm further underscores the connection between outside and in. Yessian, pictured with girlfriend Arielle Stratton and cats Jean Michelle and Jean George, tackled the interior design himself, keeping the furnishings—such as this Ikea couch, West Elm lamp, and All Modern rug—minimal and letting the views take center stage. 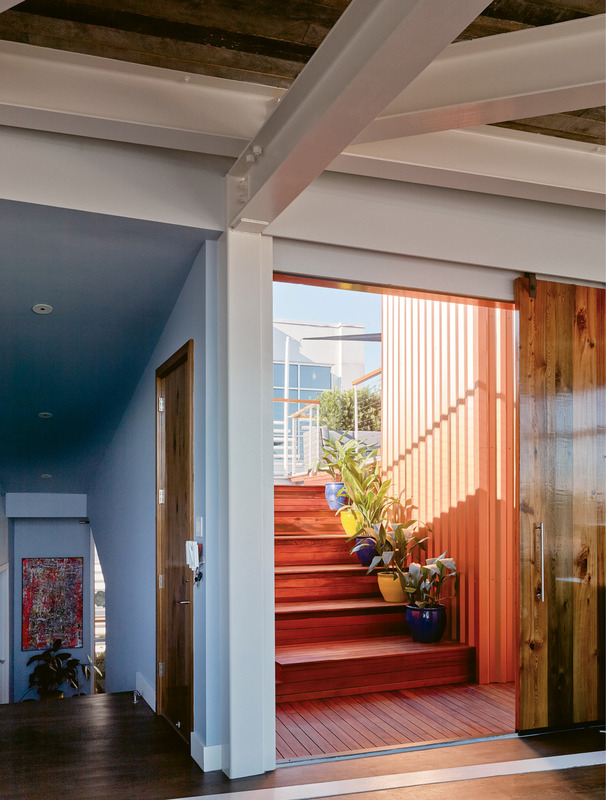 Sliding barn doors hewn from reclaimed river cypress can be left open to blend inside and outside living spaces. 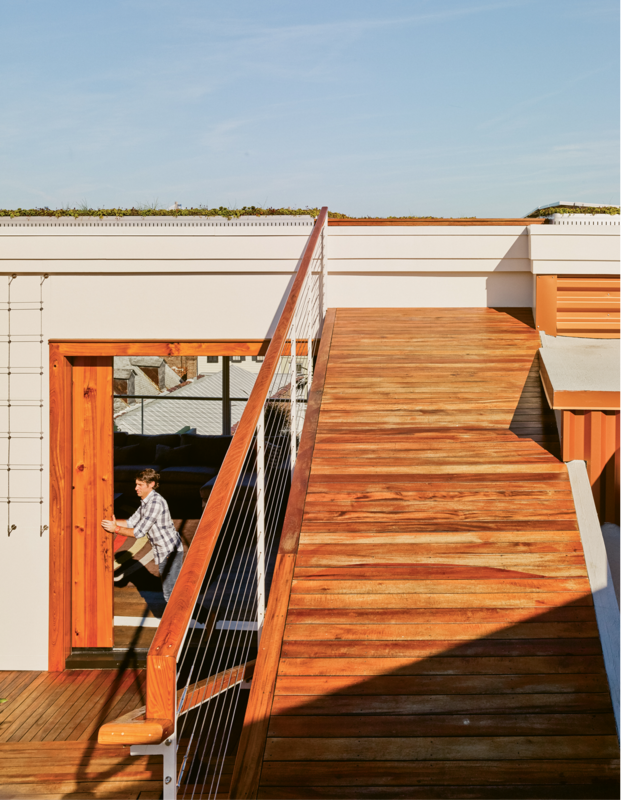 A ramp leads to a green roof offering 360-degree views of the city and beyond. Custom acrylic cabinets in cobalt blue reflect Yessian’s modern tastes. Yessian gravitates toward bright colors. He painted an accent wall in Sherwin Williams’s “Outrageous Green;” the same bold hue graces the underside of the dome lights above the dining table. Made by furniture designer Ben K. Mickus and sourced on Etsy, the pendants are fashioned from repurposed carbon-steel woks. Podocarpus hedges add visual interest and provide some privacy to the rooftop living areas. Inside, a gas fireplace with a Venetian-plaster façade can be lit to cozy things up during the cooler months. The outdoor living room is outfitted with comfortable furnishings designed to withstand the elements; a weather-resistant cabinet houses an outdoor TV. The antebellum manses that dot the peninsula have long made preservation-minded architecture buffs swoon. But it’s sleek, big-city skylines that make Rich Yessian’s heart go pitter-patter. 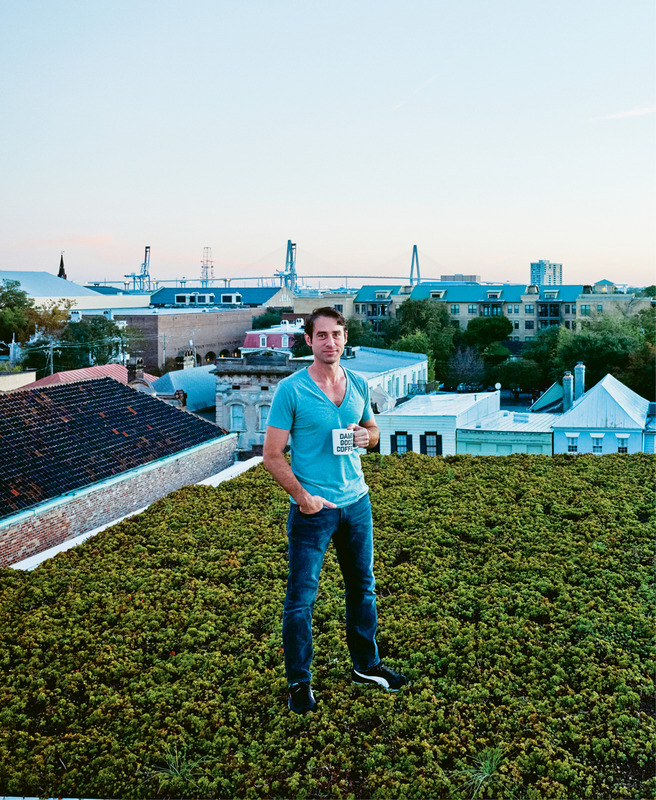 Since moving to the Holy City in 1998, the design-savvy entrepreneur—he’s co-founder and technology director of digital marketing agency Blue Ion—has savored its small community and slower pace of life. He also holds a deep reverence for Charleston’s fine historic buildings. 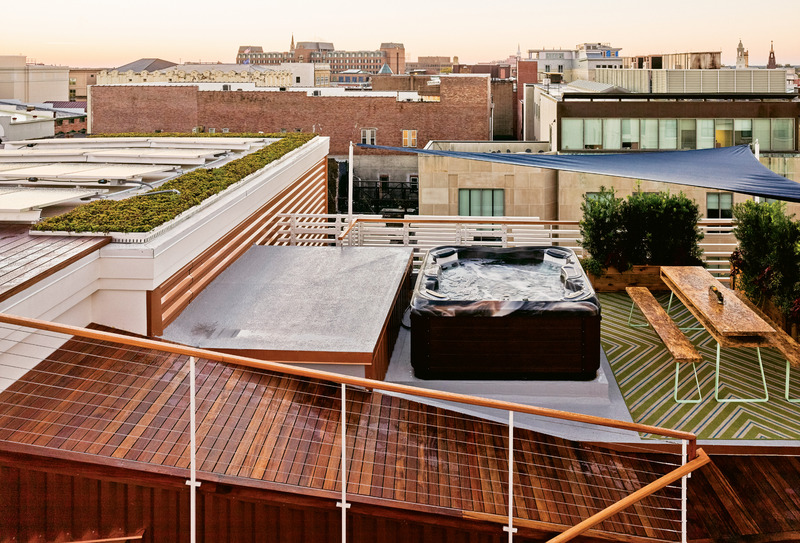 But when it came time to design his own residence, the D.C. transplant dreamt of an abode that better reflected his contemporary tastes—without sacrificing a downtown address. The result? A striking angular condo in the sky, built atop a circa-1858 structure at 301 King Street that houses an Apple Store on the ground floor and Blue Ion’s offices on the second level. Yessian worked closely with architect Kevan Hoertdoerfer, who also oversaw the renovation of Blue Ion’s office space, and general contracting firm Renew Urban to conjure the glass, steel, and fiberglass structure smack dab in the middle of historic downtown. 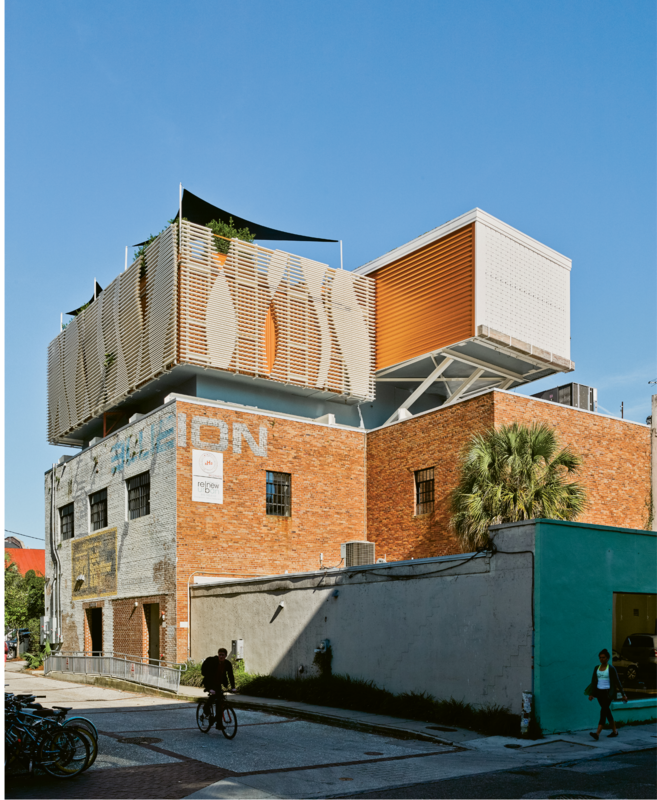 The groundbreaking design makes for a rare contemporary addition to Charleston’s skyline—no small feat given the city’s preservation groups and stringent architectural review board. But to hear Yessian tell it, the plans for his trailblazing residence evolved naturally, with relatively few hiccups. The then-bachelor had found a lifestyle that suited him. But in 2007, when the lease ran out, the firm purchased what Yessian and his partners hope will be its permanent home: a section of the second floor at 301 King, another loft-like space. The one bummer? There was no obvious nook within the layout where Yessian could make his home, and he’d grown accustomed to the luxury of a 30-second commute. 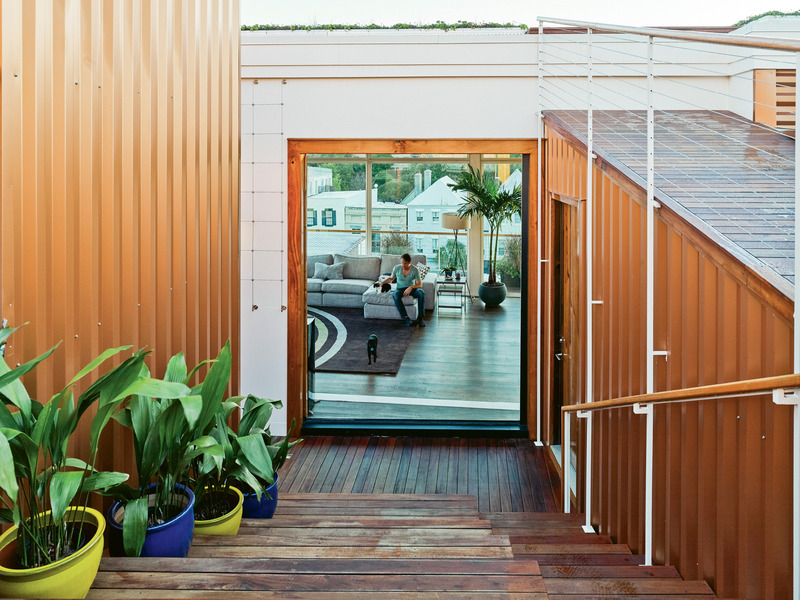 With input from these groups in mind, Hoertdoerfer, whose commercial portfolio includes renovation projects for food-and-bev fixtures such as Taco Boy and Leon’s, sketched out a 2,300-square-foot home in the sky with an additional 1,700 square feet of outdoor space, including a green roof, open-air shower, hot tub, indoor-outdoor bar, and plein-air living room. 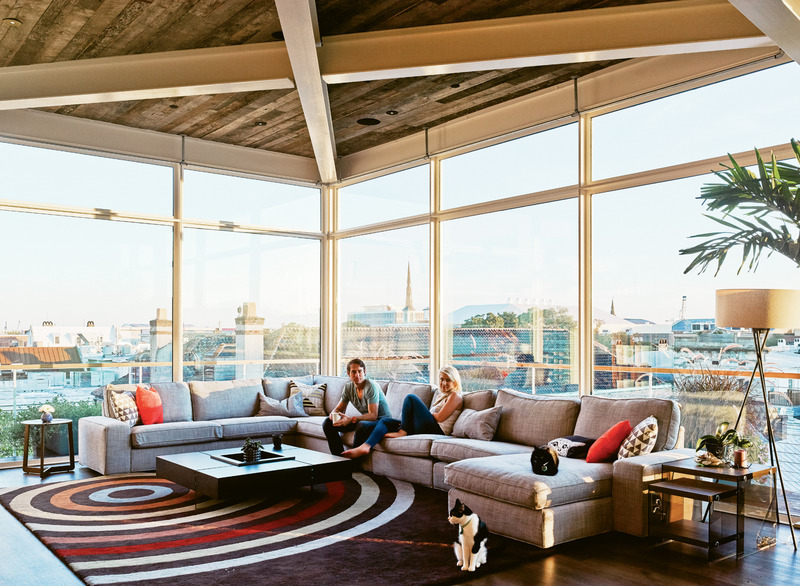 Incorporating large expanses of glass, his design ensures the site’s breathtaking views—which stretch as far as the Arthur Ravenel Jr. Bridge, Patriots Point, and beyond—permeate the interiors, too. The abode features two distinct wings: one devoted to sleeping and bathing, the other to more public living and cooking spaces. 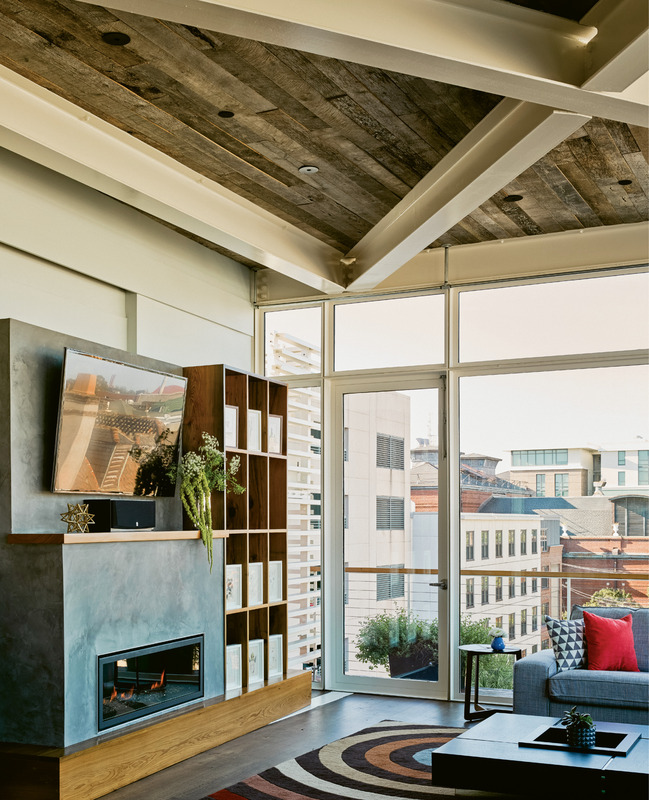 In the living room, reclaimed barn doors open to an intimate center courtyard that in turn gives way to a wide-open green roof, equipped by local firm Green Roof Outfitters with solar panels and heat-resistant succulents. “The exposure slowly increases until you’re on the roof with 360-degree views,” Hoertdoerfer says. The abode maximizes the allowable area for building, which happens to be set back, invisible from King Street. But it’s not completely secluded: a College of Charleston parking garage and dormitory overlook the site. With all that floor-to-ceiling glass, Yessian didn’t want to have to constantly adjust window treatments. So he dug up a photo he’d snapped of a building that caught his eye on a trip to Innsbruck, Austria; the structure was accented with wooden louvres arranged in a graphic pattern. Hoertdoerfer reimagined the wood beams as fiberglass panels that can be adjusted to control privacy. The undulating panels serve a stylistic purpose too, upping the design ante and making a bold, modern statement. The abode itself makes such a strong statement that Yessian—who tackled the interior design himself—kept the furnishings minimal and modern. Bold details, such as cobalt-blue cabinetry and a wall painted with Sherman Williams’s “Outrageous Green,” make a big graphic impact. 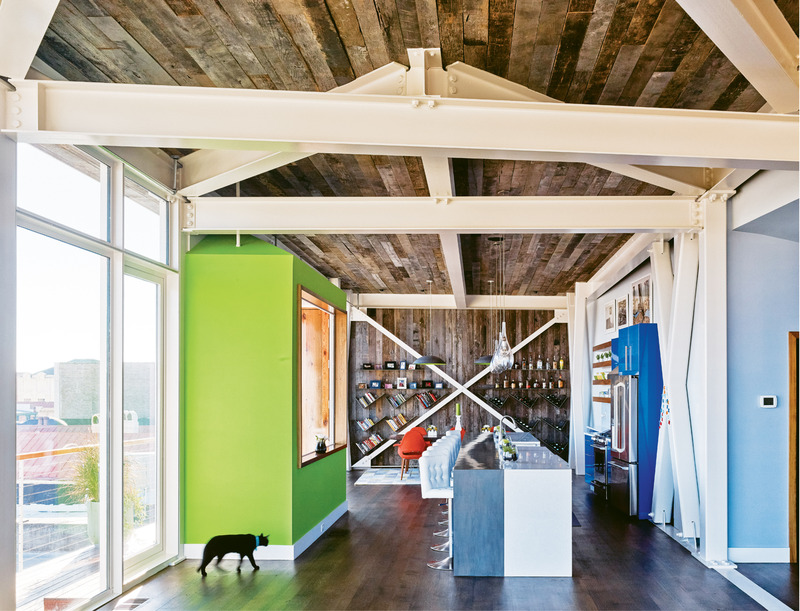 Wood, reclaimed from a barn in Kentucky, covers the ceiling and one wall in the living area, keeping the aesthetic grounded and earthy.